Smart Compliance General Business Kit w/Medium Metal Cabinet. 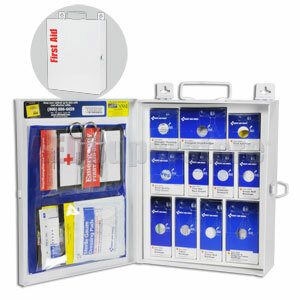 This 112-piece general business kit is ideal for businesses, offices and work sites. The swing-out door and easy-to-carry handle add extra convenience. The strong metal case is wall mountable yet has a handle for easy carrying. 12" x 10" x 4".